Home » Blog » News » I,Q Two Final #48 Bailey Bridge Middle School, VA.
Up late last night waiting for Maire to make her way to Richmond by train for DC. As a result I didn’t wake very early this morning and was only able to work on I,Q2 for about an hour today. Disappointing, but you only have the time you have. On the bright side I spent a wonderful day speaking at Bailey Bridge Middle School outside Richmond, VA, hosted by librarian Kim Kuhn and and her delightful assistant Linda. They were both a lot of fun and so were the 1,500 6-8th grade students who bussed over to the high school auditorium for the sessions. The teachers at the school went all out. There were “Roland Smith’s Book” projects on almost every wall. 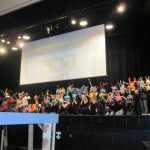 Before each talk the orchestra played “The Lion Sleeps Tonight” accompanied by students displaying animal masks they made in art class. 6th grader Olivia introduced me for each session. (I suspect she might be hosting “Today” one of these days). A fabulous lunch. And a great dinner with the principal and one of the vice principles. Hi i was one of the people who walked out on stage with our mask and i just wanted to say i love your books! ← I,Q Two Final #47. Richmond, VA.